Right now, most New England sports fans hate the Broncos. For obvious reasons. Good reasons. BUT, when it comes to hockey, the Bruins and the Broncos are actually somewhat similar. 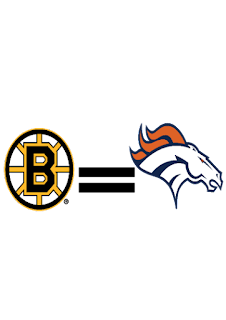 Before people get mad, the Broncos won the super bowl, so maybe the Bruins can win a Stanley Cup. Two former players, both played for their respective teams, both hired into executive positions. Both have the ultimate power to move players and have heavy influence over the team. Elway had major influence in bringing Peyton Manning who ultimately brought them to one super bowl and helped (morale support?) win them this years super bowl. Neely will also have heavy influence on the moves the Bruins make coming up soon, during the trade deadline, and like Elway, Neely will probably have to make a big splash. Lets be honest Bruins fans, Julien has been and always will be a boring defensive coach. But he wins games. He sticks to the basics, sticks to the fundamentals of hockey, and wins games. Its the same with Gary Kubiak. They might not be the most exciting coaches and sometimes they make their fans want to pull their hair out but they have won, and they have both won it all. Chara is old, 38. He is only one year younger than Peyton Manning, 39. We can see the wear and tear that age has brought on both of them. They have given all to the sport and because of it have been great for a long time (in Manning's cases, perhaps with a little help from steroids). But the more glaring matter is that both of their times in their leagues is coming to an end. Manning is expected to retire and he gets to go out into the sunset a champion. Wouldn't it be amazing if Chara could go out the same way? Chara's age is clearly catching up to him. He is still an amazing defenseman, but 82 games a season plus the post season? Father time is not kind. If the Bruins can win the cup this year, Chara can go out just like Manning, a champion. It's not a perfect comparison, I get that. But the two young guys are pretty similar. Both add offense to a team that desperately need it. They also both take some pressure off the star. Osweiler gave Manning a break, toward the end of the season, because of his "injury". Marchand scores goals and takes some attention away from Bergeron who as we all know is a beast. It gives Bergeron more room to work defensively and it also makes it easier for Bergeron to generate some offense by setting up Marchand. 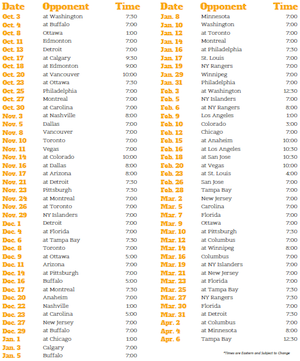 Now this is a STRETCH. Especially after last night when the Bruins gave up 9 goals. It's laughable to compare the Bruins defense to the best defense in the NFL. But hear me out. The Bruins are in a good position to make some deadline moves. If the Bruins can acquire a top defender during the trade deadline and then perhaps a top six defenseman, under Claude Juliens wing, its very possible the defense could flourish and be the best in the league again. Especially with a group of forwards that is responsible in their own end. 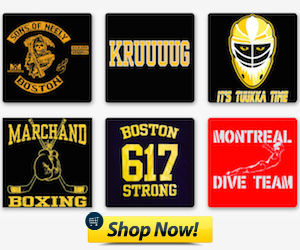 Plus, it doesn't hurt to have Tuukka in net.